The Wicker Spa Step features double steps constructed of a slip resistant synthetic wood with an attractive wicker rattan finish along the border of the step. Multiple steps can be combined with our Square Spa Surround Corner Steps to create a wrap around effect around the perimeter of your spa. Available for the following sized spas: 79 inch, 84 inch, 86 inch, and 90 inch. This Step is designed to be used alongside other items from the Square Spa Surround Furniture collection to create the ultimate outdoor oasis that perfectly surrounds your square or rectangular spa. Wicker Spa Step for 90 inch Spas The Wicker Spa Step features double steps constructed of a slip resistant synthetic wood with an attractive wicker rattan finish along the border of the step. Multiple steps can be combined with our Square Spa Surround Corner Steps to create a wrap around effect around the perimeter of your spa. Available for the following sized spas: 79 inch, 84 inch, 86 inch, and 90 inch. This Step is designed to be used alongside other items from the Square Spa Surround Furniture collection to create the ultimate outdoor oasis that perfectly surrounds your square or rectangular spa. 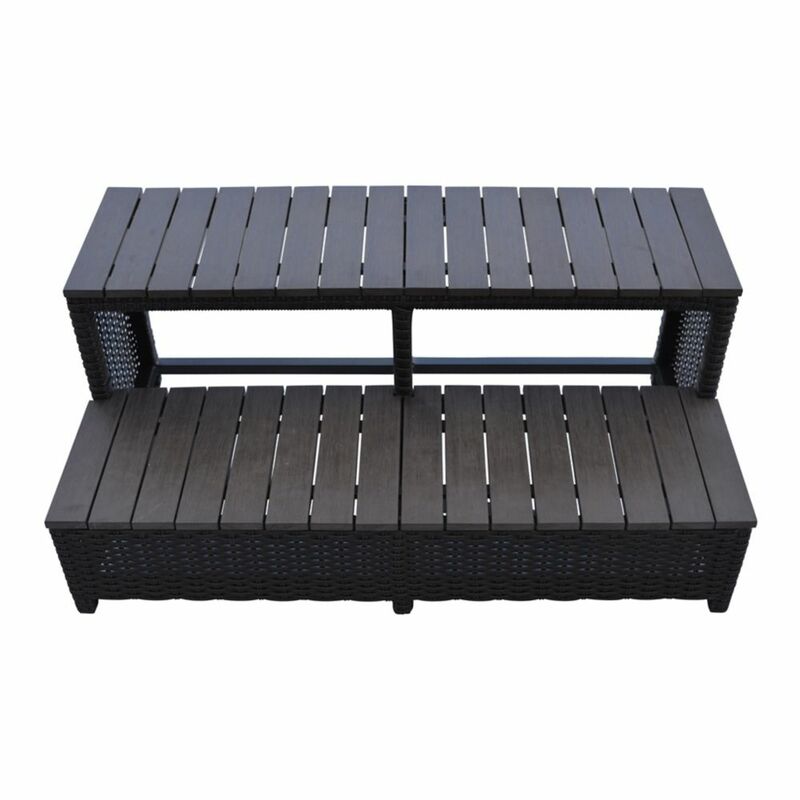 Wicker Spa Step for 90 inch Spas is rated 4.7 out of 5 by 3. Rated 4 out of 5 by Tucson from The bench was a gift for our son. It did not need assembly and was ready to use. It fit perfect w... The bench was a gift for our son. It did not need assembly and was ready to use. It fit perfect with his spa. Rated 5 out of 5 by Mybuzzshop from Arrived fully assembled. Steps are good quality, nice looking and very sturdy. Arrived fully assembled. Steps are good quality, nice looking and very sturdy.